Anti-nuclear cyclists from across London will take part in a mobile protest ahead of the general election to demand Britain’s Trident nuclear deterrent be scrapped in favor of welfare and public services. The ‘Wheel Stop Trident’ campaign will visit the London headquarters of three arms and security giants – Serco, Lockheed Martin and Jacob’s Engineering – before arriving at Parliament Square to pile pressure on the government. Peace activist Owen Everett, who is taking part in the ride, said: “Whether to replace Trident has been called the biggest spending decision of the whole of the next Parliament. Meanwhile, cuts to social services are the key issue of this election. “We’re making the link between the two. Feeling safe comes from living in a fairer society, with a free National Health Service and support when you’re unemployed or disabled. It does not come through weapons that equal mutually assured destruction. Protestor Emily Graham said: “I’m taking part in Wheel Stop Trident because these weapons are illegal, immoral and wasteful. Any use of these weapons of mass destruction would slaughter many thousands of civilians. The political rally on wheels comes only a day after the ongoing issue of Trident replacement was the subject of another high-profile row between Labour and Conservative figures. Defence Secretary Michael Fallon was accused by Labour opponents of ‘playing politics’ with Britain’s Trident nuclear weapons, in a BBC television debate. Shadow Defence Secretary Vernon Coaker said Fallon was putting Britain at risk by refusing to confirm whether the Conservatives would back the renewal of Trident if Labour forms a coalition government with the anti-Trident Scottish National Party (SNP) after the general election. 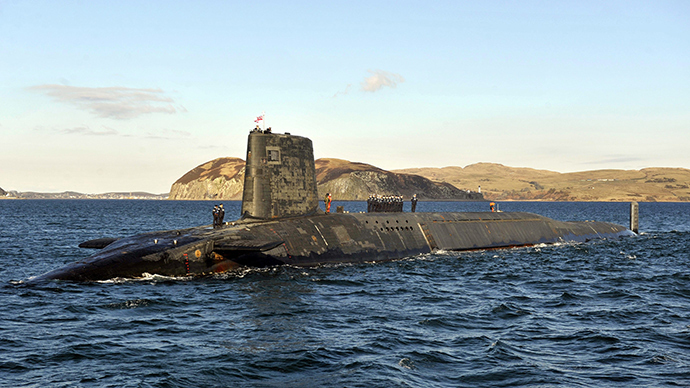 Coaker pledged Labour’s commitment to replacing all four Trident submarines in order to maintain the UK’s “continuous-at-sea” nuclear deterrent. When repeatedly pushed on the issue, Fallon said: “The country needs to avoid that question by the certainty of a Conservative government that is absolutely committed. We can’t have this confusion or uncertainty. Both major parties remain committed to Trident renewal.